Welcome to Married Life: Tiny Prints for Christmas! This weekend we're getting our family photos taken (professionally, yay!) so I can make up our Christmas cards. I've gotten so bad at corresponding with people lately, but I make it a priority to do Christmas cards and I LOVE to get ones in return, especially with pictures and some news! The big question is, how to display them. I don't really want them in a pile because I never see them and I don't have any fancy hanger or tree to put them on. Plus, I usually get around 50 and most hangers don't have that many spaces! So... I create my own tree shape on the wall by taping them up with masking tape! Start high with the first one and just add below. It won't be perfectly tree shaped, but what tree is really that perfect anyway? Instant Christmas decorations that grow through the month! I love to create my own Christmas cards and I used to hand stamp them, but when I got married and my list quadrupled... well, I don't do that anymore! And now that I have digital pictures I love to include them. 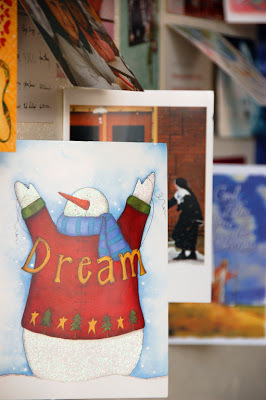 My favorite kinds of cards are the simple designs that really make your photos stand out like this Snowfall one. If you're looking for inspiration or simply want lots of choices then you should check out Tiny Prints. Great quality and service with hundreds of designer options! I can't wait to start my Christmas card tree this year! 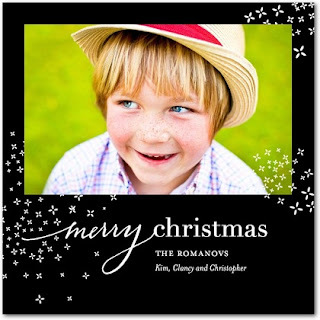 Tiny Prints provides simple, modern, and unique stationery from Christmas cards, New Years cards, party invitations, and address labels to thank you cards. Once the holidays have come and gone, Tiny Prints will still be here to fill your stationary needs with their exclusive designs from the nation’s top designers. All year round, you’ll find business cards,birth announcements and even custom wedding invitations. Come try the easy card personalization, a powerful preview engine and top-notch customer service and paper quality for yourself. With Tiny Prints by your side commemorating every holiday and momentous occasion is a cinch! This is a sponsored post, but all opinions are my own and I use Tiny Prints greetings.